Ashley Kelly trigged a National Records streak in Boston on Friday night that included marks in Arizona, New Mexico and the BVI. Kelly was second overall in the David Hemery Valentine Invitational 400m in 53.01 seconds, improving her best from 53.31, while taking down Chantel Malone's 5-year old mark of 53.23. In the process, Kelly also achieved the IAAF World Indoor Championships qualifying standard, marking the first time in its history, the BVI has two athletes qualify for an indoor championship. Kelly joins Tahesia Harrigan-Scott who has qualified in the 60m dash and ran a season's best 7.21 seconds in Houston on Friday, to win the Howie Ryan Invitational. Harrigan-Scott has consistently run 7.28 or better every year since 2002 when she won NCAA Indoor Championships silver for the University of Minnesota, with a 7.22 time. Competing at the Northern Arizona University Invitational in Flagstaff, Central Arizona College sophomore Tynelle Gumbs, improved her Weight Throw Record from 19.34m to 19.70 and broke Kelly Closse National Jr. Colleges' mark of 19.55 from 2009. Her mark is the top in the Jr. College rankings and twin sister Trevia improved her best from 16.50 to 18.01, for the No. 2 mark on the season. She was fourth in the Shot Put with a 13.32m effort. At the same competition, freshman Kyron McMaster ran 47.57 seconds for 400m on an oversized track, to place third. He also ran the 600m in 1:23.45 to win his heat and place second overall. Tarika "Tinkerbell" Moses shaved her one minute 31.92 seconds 600m mark from Jan 23 in Boston, to 1:31.10 at the Don Kirby Invitational in Albuquerque on Friday night. During Saturday's BVI Athletics Association Development Series Meet #8, soon to be 19-year old Britney Peters shattered Tynelle Gumbs' 40.12m Javelin Throw Record from last year, with a heave of 41.70m, which is also a National Jr. Record. Djimon Gumbs improved on his Youth Discus Throw National Record from 46.50m to 48.19. He also won the Javelin with a personal best throw of 46.80m. At the same meet, Jonel Lacey ran a personal best of 55.78 to lower her 56.07 best from 2013. She ran 56.27 in the prelims. Shaniyah Caul had a personal best of 57.64 in the prelims, while U15 athletes Tashara Edwards and Akrissa Euristee broke the 60 seconds barrier for the first time. Edwards ran 58.81 in the prelims and 59.06 in the finals while Euristee had marks of 59.93 and 59.90. K'Cel Moses ran under 50 seconds for the first time with his 49.93 personal best while Rakeel Jack, 15, established an U16 record with his 50.47 seconds time in the prelims and followed up with 50.59 in the final. Eldred Henry had double victories in the Shot Put and Weight Throw competing in the NAU Invitational, with a season's best 18.05m mark in the Shot and 17.07m in the Weight. He has the top Jr. College mark in the Shot Put. Karene King ran times of 7.56 in the Don Kirby Invitational 60m prelims and 7.59 in the 60m semis to finish seventh. She was also fourth in her 200m heat in 24.03. South Plains College sophomore Taylor Hill was sixth in her heat of the Tyson Invitational 60m dash with a time of 7.65 seconds. Long Jumper Chantel Malone had a season's best leap of 6.56m to finish fourth in Berlin, Germany on Saturday. She had a 6.45m opener in Stuttgart on Feb 9 where she was fourth and 6.16 in France, where she also finished fourth. She ends her European Tour in Glasgow, Scotland, on Feb 20. 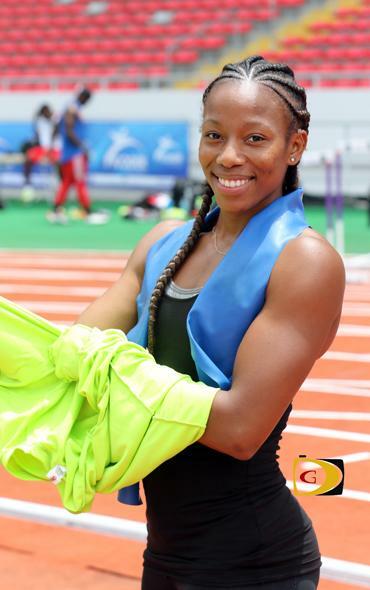 In Jamaica, Nelda Huggins won the Camperdown Classic Class I Girls 100m in 11.79 seconds. On Monday, St. Augustine Jr. Khari Herbert, became the 12th BVI athlete to win a major conference title, when he won the 400m at the CIAA Conference Indoor Championships in Winston-Salem, North Carolina. Herbert had a winning time of 48.23 seconds. He was second in his 200m heat and fifth overall in 22.06 seconds.